When did potatoes become unpopular? Potatoes have gone from nation-building superfoods to national pariahs. Why? This week, the US Congress foiled plans to limit the amount of potatoes served in school lunches. Rules proposed by the United States Department of Agriculture (USDA) stated that potatoes, along with other starchy vegetables like corn, peas, and lima beans, could be served in school cafeterias only twice a week. A Senate amendment passed on Tuesday, however, forbade the USDA from imposing such restrictions. It was a small victory in an era when the potato is often under attack. "Carbohydrate-rich foods in general have been vilified unfairly, and potatoes are the latest target," says dietician Elisa Zied, author of Nutrition at Your Fingertips. In 2007, Americans ate 20% fewer potatoes than they did in 1997, according to a report from the United States Potato Board. In the UK, potato consumption decreased by 7.8% between 2005 and 2008. It was not always this way. The potato used to be considered something of a wonder food. Grown originally in South America, its introduction to Europe literally transformed agriculture. Before the introduction of the potato, those in Ireland, England and continental Europe lived mostly off grain, which grew inconsistently in regions with a wet, cold climate or rocky soil. Potatoes grew in some conditions where grain could not, and the effect on the population was overwhelming. "In Switzerland, for instance, the potato arrived in the early 18th Century and you can see over and over again as people started growing potatoes, the population grew," says John Reader, author of The Potato: A History of the Propitious Esculent. "Birth rates rose, infant mortality improved, women became more fecund and all of that can be absolutely attributed to the potato." 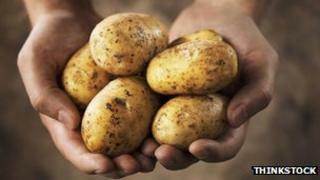 For decades, potatoes were one of the most reliable sources of energy. They grew when other grains and vegetables could not, they required little processing once grown, and they packed a healthy dose of nutrients. "For a 5.3-ounce, medium baked potato, you're looking at over 100 calories, very little fat, and one of the richest sources of potassium of any single food in the entire food chain," says nutritionist David Grotto, author of 101 Optimal Life foods. It is also a good source of vitamin C and fibre. Recently, potatoes have suffered from poor PR. Diets like Atkins and South Beach forbid potatoes because of their carbohydrate content. Starchy, carb-heavy food became synonymous with empty calories and low nutritional value, and the battle against potatoes became another front in America's relentless war on fat. The facts do not bear that out, says Mr Grotto. "Our potato consumption has been on a decline, and I'd love to say that our obesity rate has declined as well, but that's not the case," he says. One of the latest trends in nutrition, the Glycemic Index, has not been kind to the potato, either. The index measures how foods affect blood sugar (glucose) levels, and is used to help people with diabetes control their blood sugar levels. Recent diet books have also proposed the GI as a good way to prevent weight gain and monitor health. Carbs rank high on GI, and potatoes are a main source of carbs. But fears about their effect on health and weight are unfounded, says Mr Grotto, because potatoes are not eaten in isolation. "We don't eat carbs, we eat food," he says. "The effect of protein and fibre with potatoes, how the potatoes are cooked, whether they are served as a reheated leftover can all have an effect on the glycemic index." When it comes to its maligned reputation, a bigger problem is that the potato has started spending too much time with the wrong crowd. "It's been demonised for its association with the deep fat fryer," says Grotto. Not without reason. According to the Institute of Medicine (IOM) children eat less than half the vegetables they should - and of the vegetables they do eat, over 20% come in the form of potato chips, or crisps as they are known in the UK. The regulations supported by the USDA - based of recommendations from the IOM - were in part to help promote different types of vegetables instead of the starchy standbys so often served with added fat and salt. For Ms Zied, there needs to be a better approach. "The message to consumers should not be avoidance of foods that are naturally nutrient-rich, low in fat and relatively low in calories," she says. "The message should include finding ways to have potatoes and other healthful foods," prepared without an excess of sugar, solid fats, or calories. But the truth of the matter is that school children love their chips. That is why Meredith Hughes, managing director of the Potato Museum, is not worried about pockets of anti-potato sentiment. "I don't agree that the potato is vilified," she says. "I think the potato is just taking off." Ms Hughes and her family have built up the largest private collection of potato artefacts, currently located in New Mexico, but in search a permanent home. Both she and the museum are unaffiliated with the potato industry. "The potato is an incredibly influential food," she says. "It has changed the course of history, it has influenced popular culture. It has saved people from starvation." And at least for now, potatoes will continue to be plentiful in school lunches.